1946 - Official celebration of tercentenary of Newton's birth. Sir Isaac Newton (1643-1726) was an English physicist, mathematician, astronomer, natural philosopher, alchemist and theologian, who has been considered by many to be the greatest and most influential scientist who ever lived. 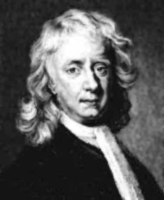 His monograph Philosophiae Naturalis Principia Mathematica, published in 1687, laid the foundations for most of classical mechanics. In this work, Newton described universal gravitation and the three laws of motion, which dominated the scientific view of the physical universe for the next three centuries. Newton showed that the motion of objects on Earth and that of celestial bodies is governed by the same set of natural laws: by demonstrating the consistency between Kepler's laws of planetary motion and his theory of gravitation he removed the last doubts about heliocentrism and advanced the scientific revolution. The Principia is generally considered to be one of the most important scientific books ever written, both due to the specific physical laws the work successfully described, and for its style, which assisted in setting standards for scientific publication down to the present time. In the late 1960s, the Anglo-Australian Telescope was being designed, being completed in 1974, and telescopes of comparable power were being contemplated for the Northern hemisphere. The community decided it wanted a suite of three telescopes: a 1.5-m, the 2.5-m INT from Herstmonceux and a new 4.5-m.